During my pregnancy, I wanted to make sure my baby and I were well nourished. I paid more attention to what I ate by planning better meals and snacks, but I also researched more about various nutrition topics to ensure that I followed a healthy vegan lifestyle. 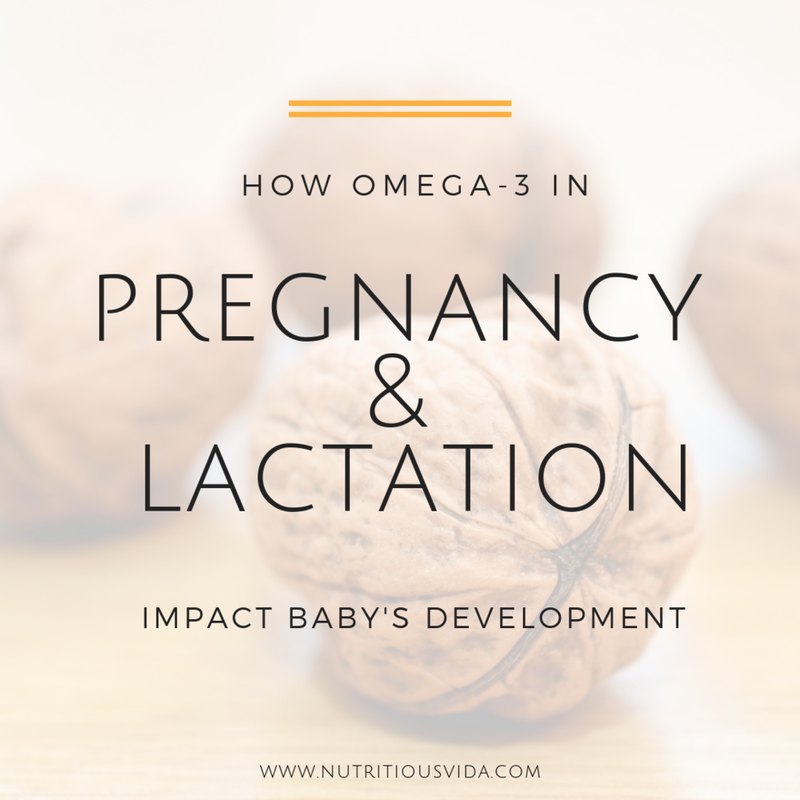 One of those topics was making sure that I met my daily needs of omega-3s as these fatty acids have continued to gain attention during pregnancy and lactation because they are particularly important in fetal and newborn neuro-development. So, to help you maintain a healthy vegan pregnancy and lactation, I wanted to share this information with you on a blog post. And let you know that it is perfectly healthy and possible to continue a vegan lifestyle during these periods of growth! Let’s start by talking about the different types omega-3s to better understand how this impacts our plant-based diet. There are three types of omega-3 fatty acids: alpha-linoleic acid (ALA), eicosapentaenoic acid (EPA) and docosahexaenoic acid (DHA). Many plant foods provide ALA and the body can convert this into EPA and DHA but its process is not very efficient and only small amounts (about less than 15%) of ALA gets converted to EPA, and even less to DHA. The Institute of Medicine has only established recommended intakes for the ALA form of omega-3’s because this is the only form that has been considered as essential - meaning the body cannot make it and must be consumed through the diet. For women between the ages of 19-50 years of age, the recommended intake is 1.1gm/day and this increases to 1.4g/day for pregnant women and 1.3gm/day for breastfeeding women. In addition, the American Academy of Pediatrics recommends breastfeeding moms consume 200-300mg/day of DHA. A baby’s retinal and neurodevelopment is much more rapid in the third trimester of pregnancy. This is particularly why it’s recommended for moms to increase and/or supplement their omega-3 intake, especially DHA. Studies have shown that moms who supplement with algae-derived or plant oil DHA during their pregnancy benefits baby by yielding better visual acuity than moms who don’t supplement. Moreover, breastfeeding moms who continue to supplement postpartum with DHA show a benefit to baby’s brain development. In addition, other studies show that moms who ate at least 0.5oz of seafood per day had a lower risk of delivering prematurely, suggesting that high-risk pregnant women may benefit from omega-3 fatty acid supplementation. Premature delivery has not been established with those who follow a predominantly plant-based diet. When should I start taking Omega-3s in Pregnancy? It’s recommended to take omega-3s, whether from plant sources or supplement, even prior to conceiving. Taking omega-3s at least three months before getting pregnant, allows time for the body to store these important essential fatty acids. However, because baby is rapidly growing in the third trimester of pregnancy, this is the most important time to ensure you’re getting adequate omega-3s. There are many plant foods that provide the ALA form of omega-3s. The table below shows the amount of ALA in grams per amount of plant food. Although you can obtain ALA from a variety of plant foods, the body doesn’t convert very much to EPA + DHA and so women must consume supplementation to meet their daily needs, especially that of DHA. Taking plant-derived supplementation vs consuming fish sources hasn’t been very clear as to how they affect baby’s health; however, some studies have shown that the intake of EPA+DHA supplements affects baby’s birth weight and extends a longer gestation - both which may be beneficial for baby. Plant oils such as canola or soybean oil don’t provide sufficient amounts of EPA and provide no DHA. Plant oils like cottonseed, corn, and sunflower seed provide omega-6s fatty acids but because they compete with EPA, it’s recommended to reduce intake of these plant oils and substitute with flaxseed, canola and/or soybean oil to obtain the rich benefits of omega-3s. Omega-3’s have an important role throughout the body. They are essential during any life stage and these essential nutrients positively benefit baby’s development. Research shows that women who are pregnant or lactating may need even more DHA during this growth period as this is passed on to baby through breastmilk. It is recommended to consume a variety of plant foods that contain the ALA form of omega-3s and a daily supplement that provides both EPA + DHA. On a side note, more research is needed to determine health impact of women who follow an exclusive vegan lifestyle as studies are limited in this population.